Theories on what caused Malaysian Airlines flight MH370 to deviate from its intended flight path from Kuala Lumpur to Beijing have shifted focus with pilot suicide, terrorism & even cyber-hijack cited as possibilities. Meanwhile the search for the missing plane has widened to an area stretching several hundred kilometres and across several countries. After a week of searching for the missing Boeing 777-200ER new data emerged that confirmed the plane had turned back, headed west and then turned either north or south, travelling for several hours before data was lost. Investigators are now convinced that someone on the aircraft deliberately took control and flew it on a different route. Soon after flight MH370 took off from Kuala Lumpur International Airport the ACARS transmitter was switched off or otherwise disabled. ACARS is used to send various types of data, such as information relating to fuel consumption, engine performance data, aircraft position and occasionally text style messages. The switching off of this data stream may have been overlooked by Malaysian Air Traffic Control however since they raised no concerns and later made the routine call to the plane when it was about to enter Vietnamese airspace. On being informed to contact Ho Chi Minh ATC in Vietnam there was only the simple audio message response, “All right, roger that” [BBC]. 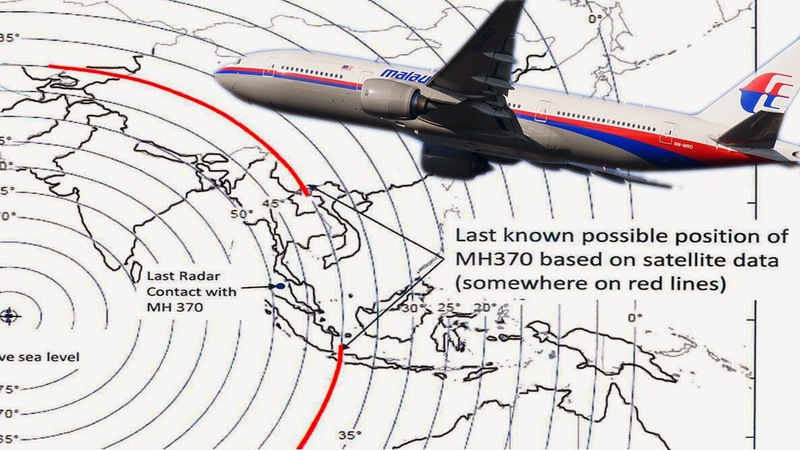 What has now become clear, from studying military radar data, is that the plane made a counter-clockwise turn and headed west back across Malaysia. Then on Saturday, one week after the disappearance of the Boeing plane, it was revealed that a satellite belonging to Inmarsat had picked up a ‘ping’ from the aircraft [Inmarsat - Press Release]. Analysts had studied this new data and extrapolated the possible route that the plane may have followed. Given only one satellite had picked up the plane, triangulation was not possible. Thus investigators could only determine the plane’s possible trajectory as being within one of two arcs that extended several hundred kilometres. One one possible route the plane would have headed was south across the Indian Ocean with no possible landing place. The other route would have taken the plane across India, China, and as far north as Kazakhstan. While the route was approximate, data showed the plane was in the air for several hours, though it has not emerged for exactly how long. From the newly uncovered data, investigators were now convinced that someone in the cockpit took control of the aircraft. The question was who and why? Suspicions have focused firstly on the pilots. Plain-clothes detectives have searched the homes of both the captain, 53-year-old Zaharie Ahmad Shah, and co-pilot, 27-year-old Fariq Abdul Hamid. Neither had, according to authorities, made a request to fly together, something that had been speculated by some media reports. There was some concern expressed by reports that the captain had an elaborate flight simulator installed at his home. Malaysia's Transport Ministry confirmed that they were examining the flight simulator taken from his home, but did not elaborate further. Neighbours, speaking to CNN, were sceptical of any suggestion Captain Shah would have endangered his own aircraft or its passengers and said the media were making too many assumptions of his owning a flight simulator. There are suggestions too that the captain was political fanatic and an ‘obsessive’ supporter of Malaysia’s opposition leader, Anwar Ibrahim [BBC - Profile / Daily Mail]. The speed at which ACARS and the transponder were switched off has prompted many investigators to dismiss the possibility of a hijacking. Flight MH370 departed from Kuala Lumpur International Airport at 00:41 on Saturday [16:41 GMT Friday], and was due to arrive in Beijing at 06:30 [22:30 GMT]. Malaysia Airlines says the plane lost contact at 01:30 [17:30 GMT] 49 minutes after takeoff. However ACARS had been switched off shortly after the aircraft had reached its cruising height of 35 feet at 01:01 [17:01 GMT]. Only on reaching cruising height would seatbelt signs be switched off. Thus terrorists or hijackers would have only a small window in which to launch an attack on the cockpit. Nonetheless, minutes may be all that was needed. The possibility of a terrorist attack is raised in several reports. The Sunday Telegraph reported that there was a possible plot being investigated after an Al-Qaeda supergrass told a court that four or five Malaysian men had planned to hijack a passenger airliner. Giving evidence at the trial in New York of Sulaiman Abu Ghaith, Osama bin Laden’s son-in-law, Saajid Badat, a British-born Muslim from Gloucester, said that he had been instructed at a terrorist training camp in Afghanistan to give a shoe bomb to some Malaysian terrorists. “I gave one of my shoes to the Malaysians. I think it was to access the cockpit,” Badat said. Badat, who spoke via video link and is in hiding in the UK, said the Malaysian plot was being masterminded by Khalid Sheikh Mohammed, said to be the principal architect of 9/11. The reports have certainly refocused the media spotlight on Al-Qaeda [News.com.au]. Should terrorists have taken control of Malaysian Airlines flight MH370 there surely must have been a motive. Several media reports point their suspicions to Uyghur separatists. Indeed such theories do have some credence. Reuters this week reported that Uyghur rebel Abdullah Mansour had said he was intent on bringing a Holy Fight to China because of its treatment of Muslims in the country. Interestingly if the plane had turned west from the South China Sea and then turned north-west towards Kazakhstan, it would have taken a direct path over Xinjiang, the Uyghur heartland. In the Reuter’s report, Mansour said attacking China was the duty of not only his party, but all Muslims. And while he made no mention of the missing Malaysian Airlines plane or a recent terror attack in Kunming, Mansour said there were many operations being planned. The Turkestan Islamic Party, which China equates with the East Turkestan Islamic Movement [ETIM], keeps a low profile in Pakistan. Unlike the Taliban, it almost never posts videos promoting its activities or ideology. Its exact size is unknown and some experts dispute its ability to orchestrate attacks in China, or that it exists at all as a cohesive group [Reuters / Guardian Liberty Voice / EuroNews / News.com.au / Daily Mail]. Aside of the obvious theories of a pilot suicide or conventional hijack there has also been the suggestion MH370 was the victim of the first cyber-hijack. Several Sunday newspapers reported that the plane might have been controlled from the ground or even on board the aircraft using something as simple as a mobile phone [CNN]. “It might well be the world’s first cyber hijack,” British anti-terror expert Dr Sally Leivesley said. Dr Leivesley, a former Home Office scientific adviser, said the hackers could have changed the plane’s speed, altitude and direction by sending radio signals to its flight management system. It could then be landed or made to crash by remote control. Again both the theory and motive are highly speculative with possible perpetrators cited as being criminal gangs, terrorists or a even a foreign power [Express / Daily Mail]. With the search now expanded across a vast stretch of ocean and several countries the hunt for flight MH370 has become all the more complicated. Many of the countries that the plane may have crossed are particularly sensitive about revealing their defence capabilities. Indeed Indonesia said on Sunday that it would have to take requests for military radar data under advisement though it said it would launch land searches. Even where countries are prepared to release data this may reveal little. Vast regions are not covered by radar or, according to some reports, operate on an “as needed” basis. The search now involves 25 countries, from the previous 14 engaged in the multi-national effort. Planes will have to seek special permission to search some territories which may further delay efforts in finding the missing aircraft. What remains a mystery is where the plane might be. Did it crash after running out of fuel? Did the hijackers or pilots land at a remote airfield and if so what has become of the 12 crew members and 227 passengers on board? If terror related there is the slim possibility they might be planning video executions such as seen throughout the Iraq War. In fact even FBI investigators say the disappearance of MH370 may have been ‘an act of piracy’ with the possibility that hundreds of passengers are being held at an unknown location not being ruled out. A more likely possibility is a failed 9/11 style plot. However the apparent north-westerly route seems to dismiss this since there are no high profile targets along this trajectory. If a pilot suicide, this would seem unlikely given the distance covered. Surely any such attempt to commit suicide and destroy the plane would have been conducted as soon as one had control of the aircraft. A cyber-hijack in some ways makes the most sense. Should someone have taken absolute control of the plane, switching off communications, transponders and sending it on a new course, the pilots may have been unable to do anything but watch as their aircraft flew towards Kazakhstan before finally running out of fuel. But what would be the purpose? If it was a cyber-hijack it could have been a test run. Finding out how far one could travel undetected or unchallenged. Indeed it does appear that the plane managed to fly without identifying itself for hundreds of kilometres whilst travelling through several countries’ airspace. The only alternative to it running out of fuel or landing is that MH370 was shot down and no country has admitted responsibility. The shooting down of a civilian aircraft has happened a number of times in the past. There have been more than a dozen such incidents since 1970 many by fighter jets who have downed airliners for violating sovereign airspace and failed to respond to radio transmissions [Wikipedia: List of airliner shootdown incidents]. However much such theories fit, there will be no real way of knowing until the plane, whole or in part, is located.